slaves. Frigdarium was for cold bathing. Round pool, overlaid in white marble still exists today. Water was brought through a system of pipes. Roof of the room was in the shape of a vault. The baths were lit by vents. From the frigidarium, one went to the Tepidarium (tepid room) where mild temperature prepared the body for the more heat of the hottest room, Calderium. Tepidarium was heated by drains under the paving stones. These rooms were not for bathing but for massage, rubs... Romans had olive oil massages. They took away the olive oil from skin by using curved iron instrument called Strigilis. Last room caldarium was heated by very hot steam. A highly technical (hypocaust) system of drains and pipes allowed water and air to be introduced to the right temperature. Slaves kept the furnaces burning in the bath houses. There were separate hours for men and women. The women's time slot was apparently much shorter. A trip to the bath was a very important part of ancient Roman daily life. It was a part of the social life. 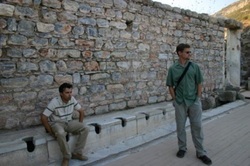 The Latrines were part of the Scholastica Baths and built in the 1 century AD. They were for public use. Poor people, who did not have toilets at home, would use the public latrines. There were 3 rows of toilets along 3 sides of a square room, each being a hole in a marble bench, total number of toilets were 48, each was seperated from each other by sculptured partitions which functioned also as arm rests. This room was kept cool in the summer by a central pool and was heated by an underground heating system (warm water from Scholostica Baths were used for heating the room). There was roof over and a fountain in the middle. On the sides there were sticks with a sponge on the edge which were used for cleaning. These sponges were kept in vinegar for hygiene. The person was taking the stick and washing it with fresh water, running in the drains in front of the toilets before using it. Since this place was for relaxing and enjoying, people did not leave immediately after the call of nature but remained here for chattting. Heroon was a 2nd century BC U-shaped building with an open Ionic upper storey. Water ran through a channel in front of the building. The gable and frieze had reliefs depicting Androclus killing a wild boar. The building is thought to have been a monument to Androclus. Hadrian's Gate/The Triumphal Arch is located at the junction of the Curetes Street and the Marble Road. Because of the limited original substance a complete reconstruction has not been possible. The gate house has three stories. On the first storey there are three entrances. The one in the center is wider and spanned by an arch and the other two side entrances are capped by architraves. The second storey was formed of four pillars and the third storey of six pillars. A gable marks the top of the building.